Atlantic salmon, although they cease to feed on entering our rivers, may be caught on fly, spinner or on bait. 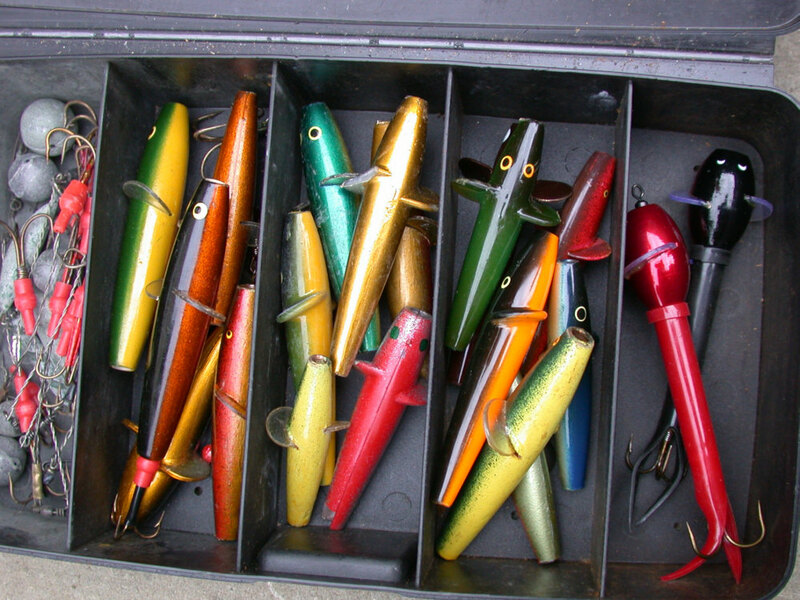 Spin fishing tackle, however, is generally now reserved for conditions of high water or for times and places when fly fishing might be impossible. Natural bait fishing for salmon, with prawns, shrimps and worms for example, has become less popular in recent years - largely due to the difficulty of returning fish which have taken a bait - and is, in fact, banned as a method of fishing on many salmon rivers. At times, the man skilled in the use of spinning tackle might outfish the fly fisher but, increasingly, wherever and whenever possible, fly fishing is the favoured option for the majority of salmon anglers on the majority of our Scottish rivers. Salmon fly rods have come a long way from the heavy and unwieldy greenheart and split cane rods and horsehair lines of yesteryear. Today's salmon fly fisher can fish comfortably for a full day with one of the many modern light and efficient carbon rods, matched to the latest profile in specially designed "Spey" lines. 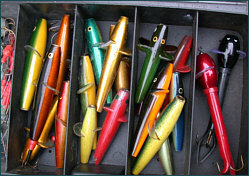 On the larger rivers, a rod of eighteen feet, in the hands of an expert, can cast a fly more than fifty yards. The more popular length of fifteen feet, though, will cover most situations allowing thirty yard casts with relative ease. On the smaller rivers, or in the low water of summer, shorter double handed rods of twelve or thirteen feet, or even single handed rods of about ten feet, will allow a more delicate presentation of the smaller flies aimed at summer grilse and salmon. 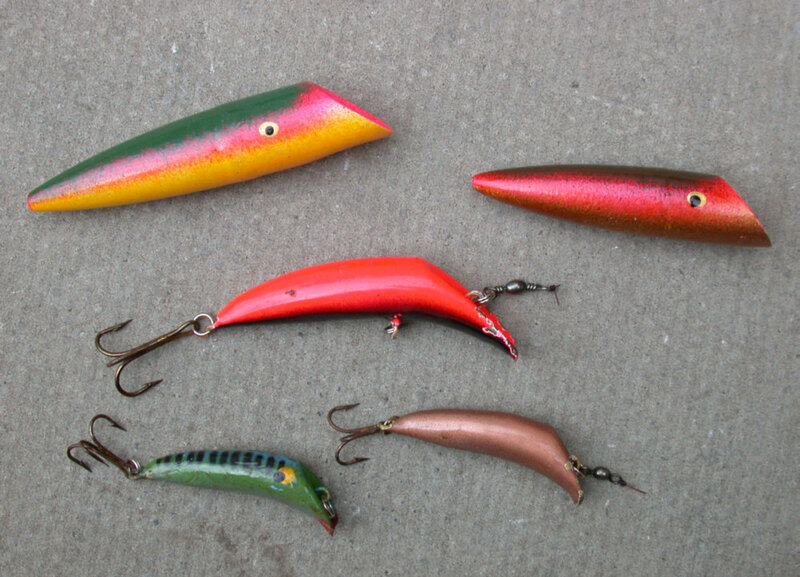 Today's tackle trade caters well for the salmon fly fisher, offering a wide range of models, from the famous traditional makers like Hardy and Bruce and Walker; from Daiwa and Shakespeare; and, now, from companies like Sage, Loomis, Orvis and Loop, all vying to make their mark in this now very competitive market. 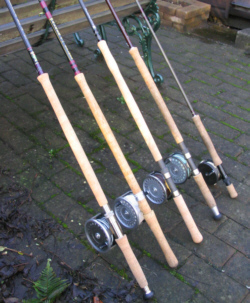 As with salmon fly rods, the salmon fisher is faced with a bewildering choice of reels, from the solid British tradition of a fine old Young's or Hardy fly reel, now highly regarded by both collectors and fishermen, and much sought after on the second hand market, to the miracles of modern disc drag technology, a Loop or an Orvis or perhaps an Abel or a new Hardy disc drag reel. 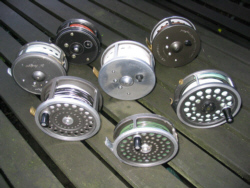 For me, the dependable efficiency of a traditional, well engineered spring and pawl fly reel is hard to beat, a reel such as the Young's 1500 series or the matchless quality of one of the older Hardy fly reels - a Hardy Perfect or a Number 1, 2 or 3 Marquis, a St Andrew or, for lighter lines, a Zenith or St Aidan. With an adequate supply of backing, any of them will cope with all eventualities likely to be met in salmon fishing on Scottish rivers. For much of the last century, salmon fly lines meant supple braided lines of dressed silk which required a great deal of care if they were to function well. 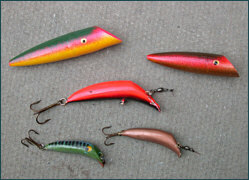 Given proper attention, however, a silk line was extremely versatile and the salmon fisherman could fish a whole season with just the one silk line. The more expensive lines were double tapered and could be fished, ungreased, as a slow sinking line; partially greased as a sink tip line; or fully greased as a floating line, the method popularised by A.H.E. Wood of Cairnton on the Aberdeenshire Dee as "the greased line" method of salmon fly fishing. The modern salmon fisherman spends little time in fly line maintenance and preparation. Instead, he has a plastic coated fly line for every conceivable situation. 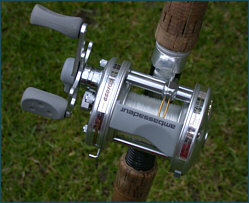 He has floating lines, sink tip lines, neutral and intermediate lines, slow sinking, medium sinking, fast sinking, even ultra fast sinking lines; he has double tapered lines, weight forward lines, shooting heads and now "Spey" lines with head lengths and profiles to suit all abilities, styles and preferences; he has tapered monofilament leaders, braided leaders, poly leaders in all manner of lengths and densities...... and all this to make the life of the salmon fly fisherman simpler! It is rare now to see a spinning rod of any material other than carbon on a salmon river. While these are generally very light and efficient, some seem very stiff and poker-like, not really an improvement on the more supple cane and fibreglass they have replaced, a misjudgement on the part of the manufacturers, I am sure, rather than an inherent unsuitability in the material itself. 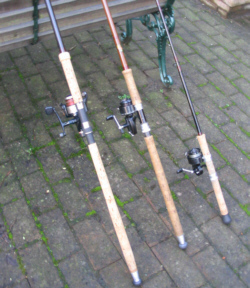 The preferred length of spinning rod will depend on the nature of the river. A small overgrown stream might demand a rod as short as seven feet, used to cast a small Mepps spoon between the overhanging branches, while the major rivers will require a more powerful rod of nine, ten or eleven feet, able to cast the heavier lures distances of fifty yards or more across the wide streams and pools of the Tay or Tweed, always assuming, of course, that spinning is permitted as a legitimate angling method. An ever increasing number of beats on Scottish salmon rivers are now designated "fly only", irrespective of conditions or season. 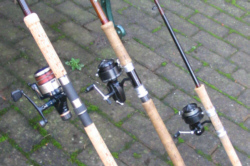 Before the invention of the modern fixed spool spinning reel and nylon monofilament line, salmon spinning was done with silk lines on centrepin reels like the Hardy Silex or Alcock's Aerial and casting a bait or spinner on these old centrepins was a practised art. Today, life is much simpler for the newcomer to salmon spinning. 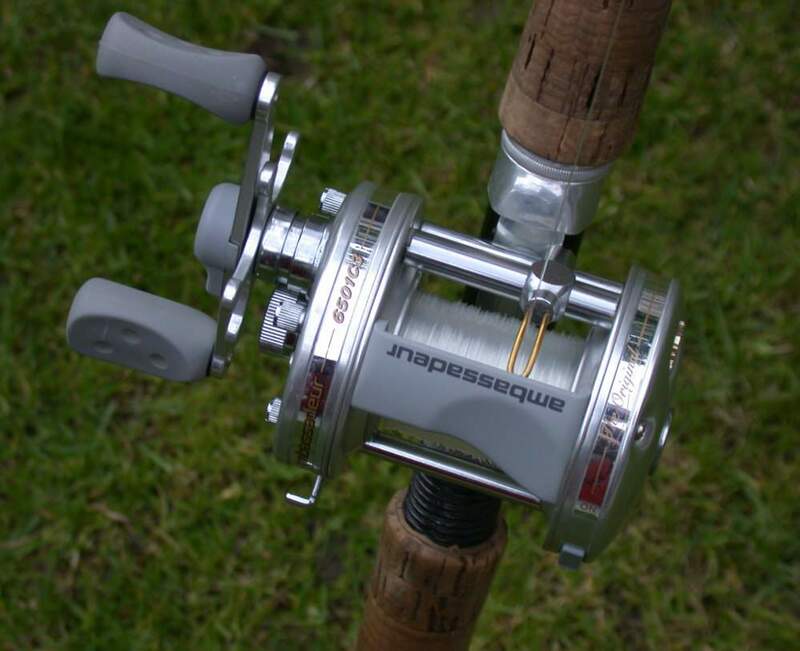 Using a modern multi-ball-bearing fixed spool reel, he can quickly master the rudiments of casting and spin fishing. 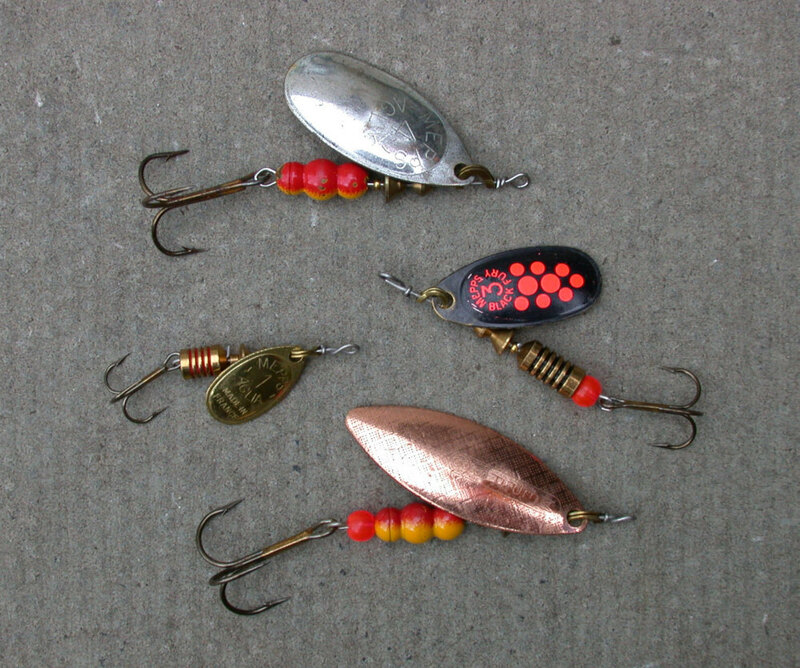 Some salmon anglers, however, particularly those fishing in the spring on the larger rivers, where long casting with heavy nylon and large spoons is the norm, prefer the multiplier, something like an Abu 6000, which allows more direct contact and better control over a hooked fish than the fixed spool. 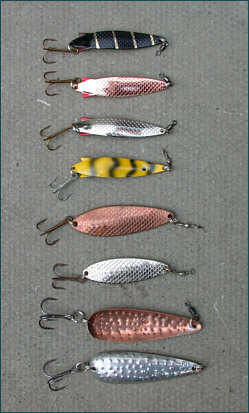 The salmon spinning enthusiast has a great array of spinning lures at his disposal. As with salmon flies, his choice might be dictated, to an extent, by the fashion of the times. At one time, there seemed nothing to beat the good old Devon Minnow, which has accounted for thousands of salmon, as has the Abu Toby. These lures still have there devotees and they still, in the right hands, catch their share of fish but the preferred options, for the moment at least, on most salmon rivers would appear to be the Rapala plug or the Flying C, available in a wide range of weights, sizes and colours. 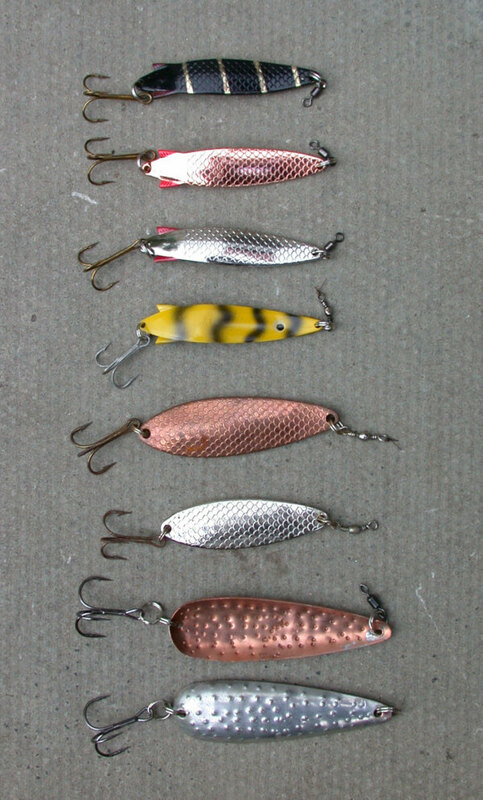 Other options, all very effective on their day, might include the Kynoch Killer, Blair Spoon, Canadian Wiggler, Tadpole, Mepps spoons in various shapes, sizes and colours...... the list of possibilities is endless.